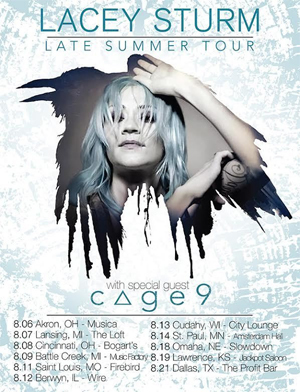 CAGE9 has announced that their first tour in support of their new album, Illuminator, will be as direct support for Lacey Sturm as she continues her "Life Screams" U.S. tour. CAGE9 released Illuminator in June 2016 in North America (to be released in August in Europe) with David Ellefson's EMP Label Group, and in Japan via Triple Vision Entertainment (making this the sixth album the band has released in Japan under that label). The two bands have a unique relationship in that CAGE9's lead vocalist and guitarist, Evan Rodaniche also produced Lacey's current solo album Life Screams. CAGE9 first performed with Lacey at her February 2016 CD release show at the Whisky-A-Go-Go in Los Angeles, and this August stretch of her tour unites them once again. Lacey made the announcement on her social media sites saying, "Lacey is excited to announce her Life Screams Tour will continue this August with special guest, CAGE9!" CAGE9's first single from Illuminator is the track that caught the attention of David Ellefson(MEGADETH). Says Ellefson, "CAGE9 is definitely the real deal. When I first heard Everything You Love Will Someday Die", it instantly struck me as the closest I've heard to a song with a true METALLICA/MEGADETH core, with the radio accessibility to really connect with a modern Rock audience." The single can be heard throughout the U.S. on Active Rock outlets nationwide, as well as featured on nationally syndicated radio shows such as Cranked Up Live. 106.3 The Buzz in Idaho Falls, ID played the song and had this to say, "We ran CAGE9 on 'Crank It Or Yank It' and the track was 100% cranked by listeners, quite a rare occurrence." For more information and ticket links go HERE.